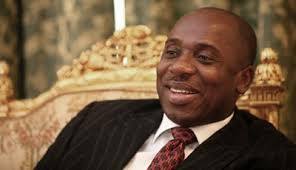 The Senate on Wednesday summoned the Minister of Transport, Rotimi Amaechi, to explain the Federal Government’s plans for railway development in the country’s eastern axis. Mr. Amaechi is to appear before the Senate Committees on Land Transport, Local and Foreign Debts but no date has been was announced. The invitation of the minister followed a motion by the Deputy President of Senate, Ike Ekweremadu, at plenary. Mr. Ekweremadu (PDP-Enugu West) alleged that the federal government was paying less attention to the eastern rail corridor from Port-Harcourt in the South-South to Maiduguri in the North-East. “Some months back, I did mention that less emphasis is being given to railway development in the eastern axis of this country. “The response we got was that the federal Government had an understanding or probably an agreement with General Electric (GE) to take over that axis and be able to restore the line in the gauge. “The tragedy now is that arrangement has collapsed, and GE has withdrawn from the arrangement,” Mr. Ekweremadu said. He said when the senate approved government’s request to raise loan from China to develop the western axis, there was an understanding that approval be secured for government to secure loan to deal with the eastern axis. “Now the story has changed. What the Chinese are being asked to do is to take over the eastern axis under a Public Private Partnership, use their own money to fix it and recover their money over time. While commending the government for its interest in railway development, the lawmaker said the opportunity must be evenly spread to give all Nigerians a sense of belonging. Sen. Shehu Sani (PRP-Kaduna Central) who chaired the Committee on Local and Foreign Debts supported the motion, which he described as apt and right. Sani said the transport minister once gave a “firm pledge” before his committee that the Port-Harcourt-Maiduguri rail line would be the next priority after the completion of the Lagos-Kano corridor. “But it is now evidently clear that there is no firm commitment and action in terms of executing that project from Port-Harcourt to Maiduguri. “The Port Harcourt -Maiduguri rail line has a lot of economic, political and social advantages in the sense that the very line will open up the areas in terms of businesses and also movement of people. “There is no reason why there should be a firm and definite borrowing plan for railway lines from Lagos to Kano, but we cannot have same from Port-Harcourt to Maiduguri,” Sani said. Also supporting the motion, Sen. James Manager (PDP-Delta South) said the South-East was too critical to business development in the country to be excluded from government’s railway development plans. “This is one issue that all Nigerians are interested in. I am from Delta, and I do know that my state is also in a way excluded. “The Federal Government is doing well as far as the railways are concerned, but no part of the country must be excluded, particularly the eastern axis. “Surprisingly, the minister is a Port-Harcourt man. After his tenure as minister, he must go back to Port-Harcourt, whether he likes it or not,” he said. The Majority Leader, Ahmed Lawan (APC-Yobe North) also supported the motion, but was quick to note that the eastern rail corridor had not been abandoned as felt by previous speakers. Mr. Lawan said the minister had explained to him on enquiry that GE only handed the eastern axis to a subsidiary. “But my concern, and that should be the concern of every easterner, is that the agreement is designed to maintain the narrow gauge. It is only rehabilitation and not modernisation. “And I believe that what we require is to give those of us from the eastern side whatever is given to everybody in the country. “But let me also inform this senate, and Nigerians that Mr President also gave the express approval and order that every state capital in Nigeria must be linked with a railway.